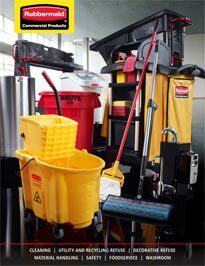 Triple Trolley efficiently transports large, bulky loads, then folds flat for easy storage. Sturdy structural foam deck won't rust, dent, chip, or peel. Non-skid platform surface helps prevent load shifting. Three-position handle lets users push, pull, or fold flat for use as a dolly. Heavy-Duty Dollies are steel reinforced, molded dollies that perform a wide variety of moving tasks. Durable, one-piece molded polyethylene decks are lightweight and easy to clean. Sturdy plastic contstruction won't rot, mildew, warp, rust, or splinter. Easy rolling, 4" non-marking swivel casters. 9T55 features 1" thick rubber pads to protect load and minimize slippage while transporting.